At GoldieBlox, their goal is to get girls building. They want to help level the playing field in every sense of the phrase. 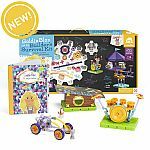 By tapping into girls strong verbal skills, Goldie Blox's story + construction set bolsters confidence in spatial skills while giving young inventors the tools they need to build and create amazing things. In a world where men largely outnumber women in science, technology, engineering and math...and girls lose interest in these subjects as early as age 8, GoldieBlox is determined to change the equation. Construction toys develop an early interest in these subjects, but for over a hundred years, they've been considered "boys toys". By designing a construction toy from the female perspective, we aim to disrupt the pink aisle and inspire the future generation of female engineers.